This Aztec children's Teepee Wigwam play tent made with natural cotton canvas fabric and wooden poles for wonderful durability and strength. The thick cotton canvas has a waterproof coating so it's perfect for indoor and outdoor play in the garden, and the thick wooden poles are really easy to assemble using sturdy plastic connectors and pre-sewn fabric pockets to provide a strong and stable support. A kid's teepee (also known as a tipi!) brings exciting and long lasting adventures, and our unique 6-pole design offers extra stability and feels brilliantly spacious. 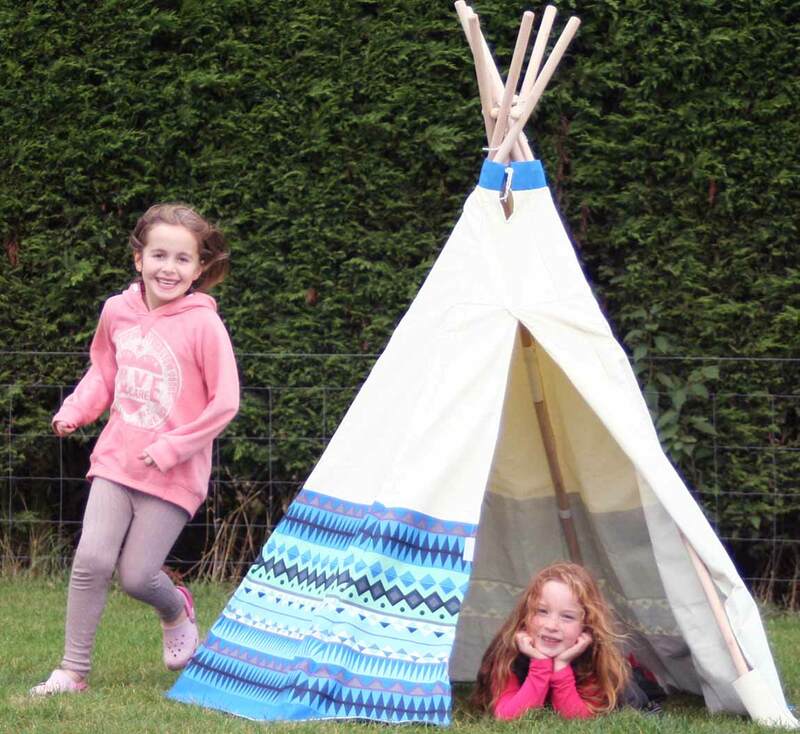 The traditional theme makes the Aztec wigwam perfect for boys and girls, inspiring lots of imaginative play and the large diameter of 140cm provides a space for siblings and friends to enjoy playing together. This child's teepee play tent features a fun Aztec print with soft blue shades on a cream-white canvas, offering a timeless design that will blend into the garden beautifully and provide a long lasting play area for the children. Natural cotton canvas is particularly thick for strength and durability, while the strong wooden poles create a sturdy, long lasting frame for many years of imaginative play. Durable wooden poles connect together using hardwearing plastic connectors that slot through thick elastic ties and sit in pre-sewn fabric pockets at the bottom. Aztec blue print is perfect for boys and girls, making it popular with all little ones! Waterproof coating on the canvas is perfect for play indoors and outside in the garden. Wigwam is quick and easy to fold down or completely reassemble for different occasions! – Perfect for family garden parties or children’s parties! Large internal height of 150cm and diameter of 140cm gives the children plenty of room for inviting their friends and siblings round to play!